I really like that too. If Nasa said "Drop everything... we need you in space", the speedy pro would be the one thing from home you could take with you. It's already got the space flight seal of approval, pretty incredible! I wanted to add a Speedy (FOIS) to my collection but after seeing it ... it did not really do it for me. I do like classic watches with a little more style to them. Case in point, the most utilitarian watch there is (Rolex Sub no Date) maintains its heritage and design but is updated with ceramic, deep black face, stunning edges on the bezel, etc. to appeal to my sense of style. If the current Sub was dull looking, I wouldn’t have purchased it. The Speedmaster Professional is essentially a vintage watch that has been in continuous production, so of course it doesn't impress like a modern sub does with its up to date technology and finish. If you are looking for a modern interpretation of a classic, a Speedmaster 9300/9900, especially the ceramic cased version, would be a better alternative. Just like the 6 digit sub, it is a modern interpretation of a classic design. Dougiebaby and Paulsky like this. I agree, the Speedy that most appeals to me is the Grey Side of the Moon (even thought it is a little too large for my liking). I think Rolex ruined the perfect proportions of the five digit Sub by fattening the lugs and the crown guards. I know they’re still selling like hot cakes but Rolex went and did something that Omega has chosen not to do with the Speedy. The maxi dial, harking back to the 5513, in the old style case would have been the ideal Sub. The only bad move Omega has done with the Speedmaster is put it on a modernized, slightly blingy, and to my mind ugly bracelet. 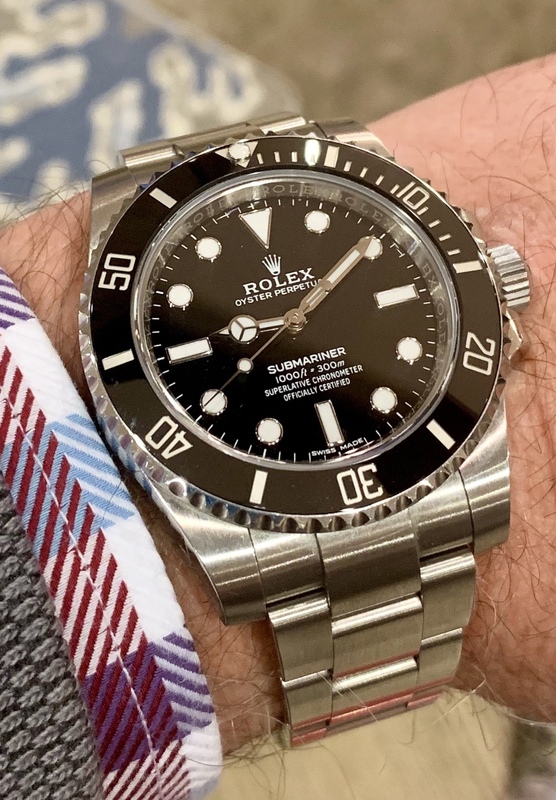 Obviously, looks are subjective but I believe the maxi dial & supercase made the Rolex Sub/GMTII/et al more attractive ........ and the market seems to agree. This! I just took delivery of mine two days ago and I'm absolutely thrilled with it. To me, there may not be one single particular thing about it that completely blows you away, but when you put it all together the whole is greater than the sum of its parts. My wife, who isn't a a watch enthusiast really likes it, more so than she has liked most of my watches and when I asked her why, she said she wasn't sure. She said it just has "it". G-times and BufordTJustice like this. I think the thing about the Speedmaster Professional is you have to find the right model for you. Is it a modern, brand spankin' new speedy? Is it one of the limited editions? Let's go back in time to moon watch 69, then go to AML, then striaght lug, then leaf hand...if one doesn't do it for you move on to the next and check it out. Congrats on the speedy! I agree, that's a good way to put it. When you add it all up you can't help but love it! To me, it's the endless release of so called 'limited editions'. I really appreciate the Speedmaster Pro, but I got rid of mine because it does seem underwhelming. If they would add applied indices or something maybe it would appear a little more like the luxury watch that it is, but in reality it IS a tool watch with an immense amount of history that SHOULD be left unchanged because of this. I also think that because they haven't changed the appearance of the watch, it makes it that much more desirable to collectors. Rolex's success is built around this model and its proven a success. BarracksSi and BufordTJustice like this. The only bad move Omega has done with the Speedmaster is put it on a modernized, slightly blingy, and to my mind ugly bracelet.